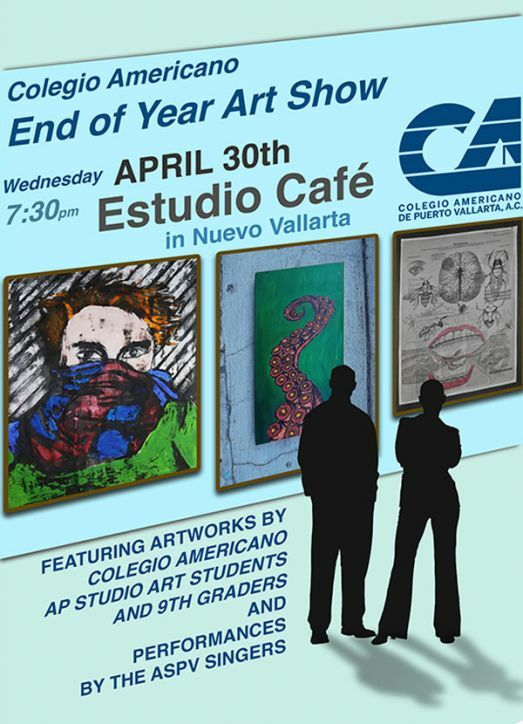 The American School of Puerto Vallarta AP Art classes will be holding their end of the year art exhibition at Estudio Café Gallery. There will be an opening reception at the gallery located in Nuevo Vallarta and it is open to the public. ASPV art teacher Licia Rossetti decided to partner up with artist and gallery owner Federico Leon de la Vega to organize the exhibition at the gallery. Holding the exhibition at the gallery will allow students to exhibit their work in a real world setting and also allows students to have the experience of having their art work shown to an audience outside the school. On exhibit will be the artwork of the Advanced Placement (AP) Art classes as well as 9th grade students. The artwork is a collection of the student’s best work produced throughout the school year. There will also be performances by some of the school’s student singers. When: Wednesday, April 30 at 7:30 p.m.